Knowing where to find a job is the first step. In today’s career search, the Internet is vital. Gone are the days of faxing and door-to-door marketing. (Although, do not discount those methods!) Email and the Internet are here and they are not going any where, any time soon! 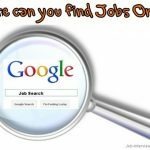 Most companies utilize an applicant tracking system and tailor their searches to Internet job boards. Similarly, most recruiters find potential candidates by searching around on the Internet, using buzzwords found on a resume. Most companies and recruiters want you to email them a resume, so setting up a free email account is essential. Unless a hiring manager networks his or her way directly to you, you are going to have to learn to use the Internet as a main source of finding that right career for you. If you do not have Internet access, use a friend or family member’s computer or go to your local public library. If you are an Internet novice, enroll in to a class to learn the basics of Internet terminology and navigation. Look for affordable Internet classes at your local public library, community colleges, high schools or other institutions in your area offering these classes to the public. Do not be intimidated or embarrassed. As we stated earlier, in today’s career search, the Internet is vital! Create an electronic version of your resume with a word processing program (e.g., Microsoft Word). You may also want to create an Adobe PDF version of your resume. Depending on where you post your resume or where you email it, they may want a Word version or PDF version. Set up an email account to provide instant access of your resume to employers, networking contacts or recruiting professionals. Free email accounts are available through Yahoo, Google (Gmail) and Hotmail. Create an appropriate and professional email account name, not “BeerDrinker@___.com”. Do not submit your resume with a confusing attachment named “821080res.doc (for example), but rather use your name or a descriptive label (e.g., job title).